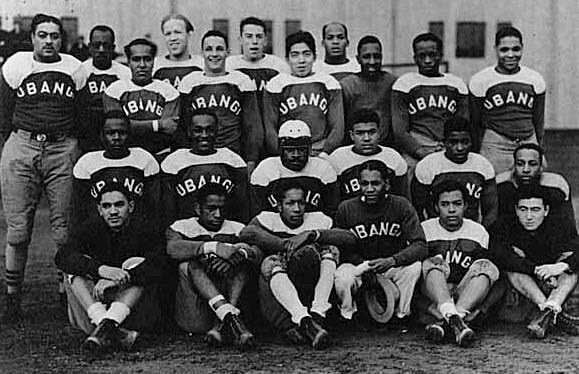 The Ubangi Blackhawks were a predominantly black semipro football team in Seattle who played for the Community League in the 1930s. Sponsored by nightclub owner “Noodles” Smith, who was said to be present for every game, the team was also helped by Bruce Rowell who looked after the team’s financial and physical health. In 1937 the Blackhawks were considered the most sensational team in the league, and during this time the community rallied behind such players as George “Switchy” Height, Rhino Nakamura, Brennan King, and Joe Staton. The Blackhawks won the first six games of the season without allowing a single score, and this led many to think they were unstoppable. There was some question as to whether the nightlife of some of the players and internal dissent among the team would sabotage their season, after they were upset by the National Guards in the seventh game of the season. There were no such misgivings after the Blackhawks came back and beat the National Guards 13-0 in the league finals; they won the Community League football title. After the game Brennan King was awarded the James Scavotto trophy, which he promptly gave to “Noodles” Smith. Quintard Taylor, The Forging of a Black Community: Seattle's Central District from 1870 through the Civil Rights Era. (Seattle: The University of Washington Press, 1994); Northwest Enterprise, November 5, 1937, pp. 1 and 4; November 19, p. 4; November 29, pp. 1, 4; and December 24, p. 1. Quintard Taylor, The Forging of a Black Community: Seattle’s Central District from 1870 through the Civil Rights Era. (Seattle: The University of Washington Press, 1994); Northwest Enterprise, November 5, 1937, pp. 1 and 4; November 19, p. 4; November 29, pp. 1, 4; and December 24, p. 1.